CHAPMAN CHEN was born in Hong Kong. He has a doctorate in Chinese Literature from the City University of Hong Kong and is a doctoral candidate at Joensuu University, Finland. His bachelor's degree is in English Language and Literature and his MA is in Translation. He has a Certificate in English Literature from the English Summer School, Cambridge University (UK), and a Todistus (Certificate) for an Advanced Finnish Course, undertaken in Finland. For over eight years, Chapman was a Court Interpreter (and translator) for the Hong Kong Government Judiciary, doing oral court interpreting (English, Cantonese, Mandarin) and translating and certifying law-related documents. Subsequently for a number of years, he taught Chinese, translation and interpreting in tertiary institutions in Hong Kong and elsewhere. More recently, he has worked as a freelance Interpreter and Translator for various agencies and some print media. He is an Examiner/marker for the Diploma in Translation Examination of The Institute of Linguists Educational Trust, London, UK. His many publications include literary and academic translations as well as academic works. Caleb Kavon's "The Monkey in Me" (2009), published in 2010. Olga Wallo's "TIghtrope! A Bohemian Tale" into Chinese (pubilshed December 2011). Dr Chapman Chen talks about his translation of Olga Wallo's "Tightrope!" into Chinese on YouTube. Respected translator, Dr Chapman Chen, has sent us links to video-recordings of his talk in a Hong Kong bookshop about his translation into Chinese of Olga Wallo's autobiographical novel, "Tightrope! A Bohemian Tale". CZECH CONSULATE GENERAL, HONG KONG -- A small ceremony was held in January 2012, when Proverse Publisher, Dr Gillian Bickley, presented a copy of Dr Olga Wallo's Book, Tightrope! 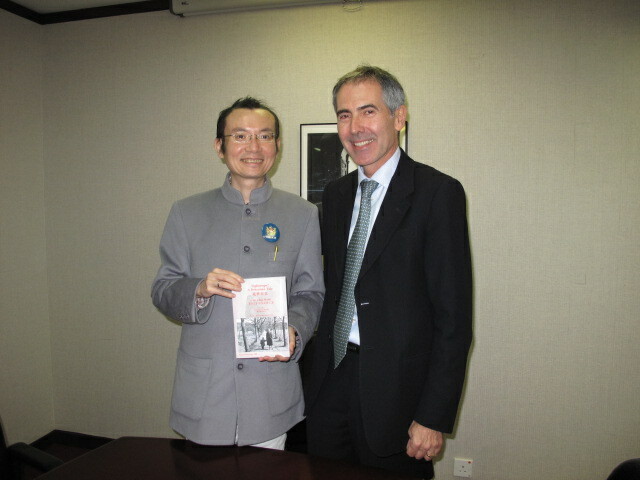 A Bohemian Tale, translated into Chinese by Dr Chapman Chen, to Mr Jaroslav Kanturek, Czech Consul-General. The book was published in December 2011. The photo shows Dr Chapman Chen (L) and Mr Jaroslav Kanturek (R).